40l. 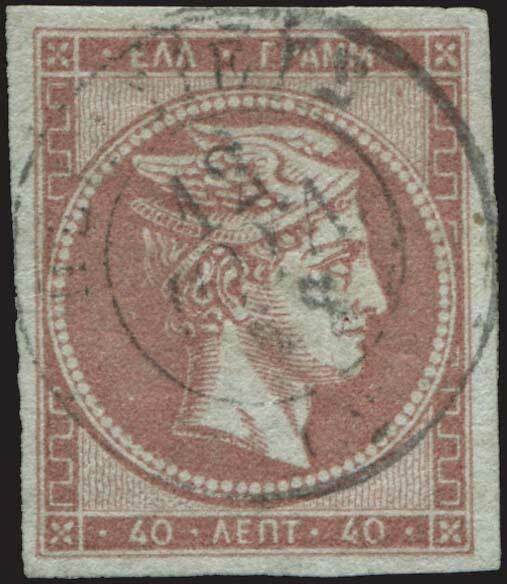 rose-lilac on greenish (Solferino), cancelled with "ΠΕΙΡΑΙΕΥΣ (2)*12 ΙΟΥΛ. 72". Twelve single copies, one on fragment and one on cover are only known of this rarity. THIS COPY IS THE 1st ON THE QUALITY RATING AMONG THE 14 KNOWN EXAMPLES. Certificate from P.Holcombe (1992). ONE OF THE MOST IMPORTANT RARITIES WORLDWIDE. RRRRR. (Hellas 36a).